Landlocked Central Asia is home to two major rivers, the Amu Darya and Syr Darya, as well as two inland seas, the Caspian and Aral. But water resources in the region are disputed. The Caspian Sea is heavily polluted and the Aral Sea is on the verge of extinction. Massive irrigation systems were developed in the past to sustain water-intensive crops such as cotton, wheat and rice in the steppes and deserts of Kazakhstan, Uzbekistan and Turkmenistan. These systems have caused Central Asia’s largest environmental disaster – the drying up of Aral Sea – and they have the potential to further threaten the livelihoods of Central Asia’s population. Water has been a matter of contention between upstream and downstream countries, in particular between downstream Uzbekistan and the two upstream countries, Kyrgyzstan and Tajikistan. Water management problems are at the heart of regional political and economic tensions. But any successful effort to deal with environmental issues also faces multiple challenges at the national level, from technical defciencies to lack of capacity and resources to lack of political will and economic incentives. The infrastructure inherited from the Soviet era is, in some cases, no longer viable, and in others, it requires heavy maintenance, which the weak and impoverished states are not able to afford. 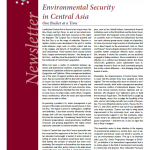 As pressing a problem it is, water management is just one part of the wider environment-security nexus in Central Asia. The region is prone to earthquakes, mudﬂows and landslides. It has been severely affected by climate change and it still has hazardous Soviet nuclear waste that must be cleaned up. Considering Central Asia’s lack of disaster preparedness, weak governance, insuffcient resources and growing populations, the region seems especially vulnerable to extreme weather events. A joke in Central Asia says that if every researcher who has assessed the regression of the Aral Sea in the last two decades had brought a bucket of water instead of writing an article, the problem would have been solved. And indeed, the amount of research has been overwhelming. But research on the problem has been poorly coordinated, and often, policy makers in the wider donor community have not consulted it. International donors have given substantial attention to environmental issues in general and to water management in particular, but so far, there have been few results. There are two main reasons for this failure to achieve signifcant changes: poor donor coordination and lack of responsiveness from Central Asian elites. Donor coordination on problems that are largely regional by nature is diffcult. Large donors are active in the region, such as the United Nations, international fnancial institutions such as the World Bank and the Asian Development Bank, the European Union and certain European countries such as Finland and Switzerland. But how can such a diverse group create a single set of priorities, let alone also involve large investors in infrastructure that has a direct impact on the environment, such as China and Russia? Severe disputes between the Central Asian countries further complicate effective donor coordination, because it means the countries are not positively engaged in fnding solutions. Since coordination is most effective on a national level between donors that follow OECD-DAC guidelines, active stakeholders have increasingly chosen to focus on small community projects that make a direct difference – thus bringing along their bucket of water. Meanwhile, the responsiveness of Central Asian states is weak and the policies they have adopted are short sighted. The rent-seeking elites have no interest in environmental hazards, while water management questions have become matters of international dispute. One of the most serious tensions involves Tajikistan and Uzbekistan, who disagree over Tajikistan’s plans to build the enormous Rogun dam. The World Bank is caught up in the dispute, since it has to judge the feasibility of the dam, and so risks falling out with one or both of the parties. The most inﬂuential external actors, Russia, the EU, the U.S. and China, prefer to stay out of local squabbles over water resources. Donors can help to bring about improvements at the community level, even when local governmental support is low. But eventually, larger issues need to be addressed through locally grown regional cooperation – and there are, as yet, no signs that this is likely to happen. 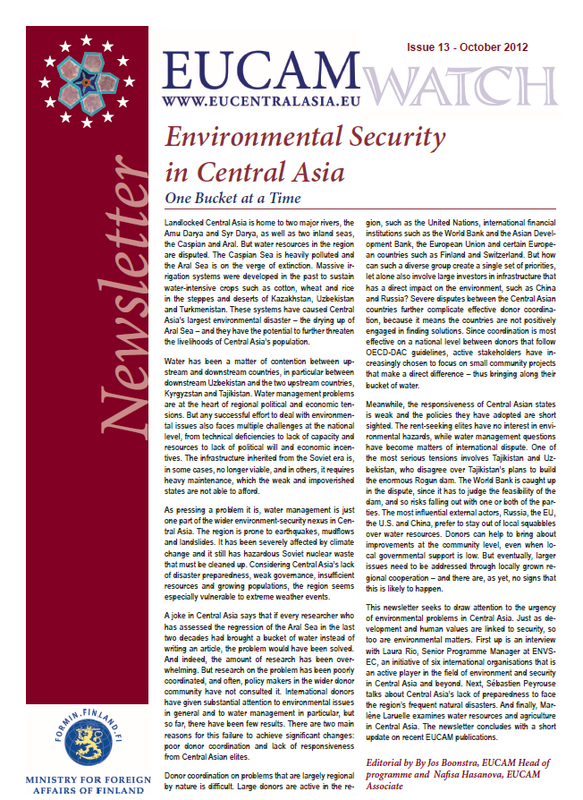 This newsletter seeks to draw attention to the urgency of environmental problems in Central Asia. Just as development and human values are linked to security, so too are environmental matters. First up is an interview with Laura Rio, Senior Programme Manager at ENVSEC, an initiative of six international organisations that is an active player in the feld of environment and security in Central Asia and beyond. Next, Sébastien Peyrouse talks about Central Asia’s lack of preparedness to face the region’s frequent natural disasters. And fnally, Marlène Laruelle examines water resources and agriculture in Central Asia. The newsletter concludes with a short update on recent EUCAM publications.